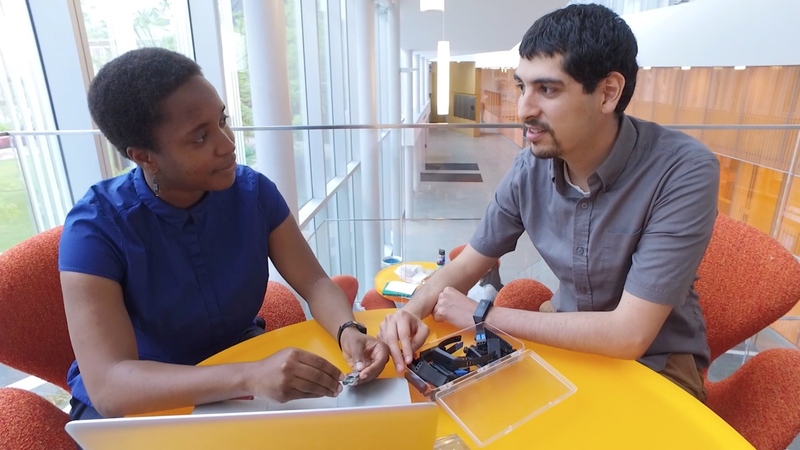 Engineering seniors Alfredo Muniz and Sade Oba at the University of Pennsylvania are developing a wearable that can detect tremors with people who have Parkinson's. The pair also began a startup called XEED to keep the project going and already have plans to meet with several foundations. According to Oba in a video on UPenn's site, XEED "is a company that's focusing on improving physical therapy for those with Parkinson's disease." The band, also called XEED, has sensors and algorithms that track a person's tremors in from the wrist or ankle - though movements from other body parts can also be detected - then records it in an accompanying app. A physical therapist can then use the information gathered to better track progress. All the collected data can help people with Parkinson's figure out how to best manage the disease throughout the day. The data sets can also be used by the medical researchers in addition to helping the patients. Talking to TechCrunch, Muniz said the team is already creating a third prototype that will be tested by monitoring how the device is put on, if the LED indicators are helpful, whether users remember to charge the wearable and modifying the app. Though still in the early stages, the project sounds promising and we're looking forward to seeing more from the XEED team.